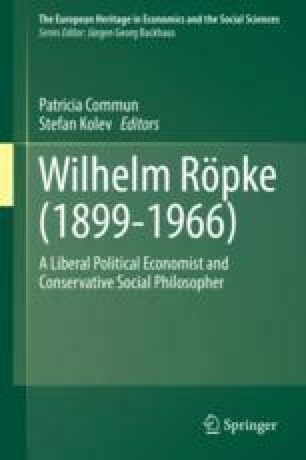 By analyzing how excessive state intervention leads to the bureaucratization of the economy and primarily benefits a class of politicians and bureaucrats, Wilhelm Röpke anticipated core elements of Public Choice Theory. In Ciampini’s account, Röpke described the behavior of special interest groups who exploited the dynamics of the welfare state’s growth, pressuring politicians and bureaucrats to extract additional privileges. According to Ciampini, Röpke conceived a series of public choice arguments before key concepts like “rent-seeking” were formulated by Public Choice theorists James M. Buchanan and Gordon Tullock. In this analysis, Röpke’s understanding of the political process comes close to Buchanan’s research programs of Public Choice and of Constitutional Political Economy.